While spring is often hailed as the wedding season, if you’ve ever been involved in the production of one, you know that wedding season is year round. Deal hunting and planning commence as soon as a proposal is accepted, regardless of the heat index or daylight savings time. Adorii aims to help couples enjoy their big day, staging unforgettable memories while managing to hold on to precious dollars with discounts on wedding products and services. I’m a sucker for language, and I’ll admit that the company name and the word play scattered like tossed rice throughout the blog enticed me to check out this startup–while I myself am not in the market for tuxedos or a coordinator’s services in the least. Behind the Seattle company are co-founders Matthew Matsudaira and Carolyn Gerin. Matsudaria previously worked at Venpop as the VP of Sales. Gerin also serves as President at Anti-Bride Productions, and she has an extensive background in disrupting the wedding industry. 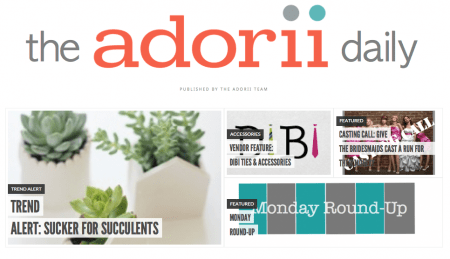 While the combination of stylish and savings might magnetically draw cynics, there’s reason to trust Adorii. Just because the site curates bargains for products and services, and tries to help make a wedding cheaper, the company itself doesn’t have the luxury of coming across as commonplace or bottom shelf. Everyone wants a graceful wedding–no matter how informal or unorthodox. Adorii sounds classy and distinct. If you haven’t heard the name before, that might be because the company was formerly Wedcoupon. No matter what the budget, the significance of the big day never diminishes. Adorii sounds a lot more elegant than coupon. It gives the company more flexibility as well. They’re not trafficking only in coupons. Stick “coupon” in your URL, and you’re only going to attract coupon seekers. You greatly reduce the party of potential clients that have an interest in sales, promotions, discounts and bargains that don’t involve coupons. The name change that accompanied the pivot was a brilliant move. A clever double entendre for a double engagement. Yes there is the person you’ve asked to marry you. And then there’s the wedding itself, which you may not have realized that you’ve just asked to consume your world and color all your thoughts until well after the momentous day. The phrase “for the engaged and the invited” shrewdly welcomes everyone involved in the wedding to have a look. Family, friends, wedding party–usually they all play a very active role in helping, so it only makes sense to include them. The hitch if you will, accurately targets customers. Furthermore, the astute word choice (it’s amazing how little effort so many startups put into wording their sites)displays a level of thought and attention to detail that recommend doing business with the company. I know, I know, language is only good for so much when it comes to pricing venues, bands, caterers, and honeymoons, so how does 25-80% off the retail prices sound? Adorii advertises just such savings. If contemplating who will sit at what table or selecting the color for the lettering on invitations makes elopement sound like the best option, that’s understandable. Before costs send you running to the courthouse, you may want to give Adorii a shot.